This is James Martin’s easy take on pub snacks - great to prepare for a night in with friends. Boil four of the eggs in a pan until soft-boiled (about 5 minutes). Drain the eggs and transfer to a bowl of iced water. Set aside for 10 minutes, or until cold, then drain and peel. Roll the sausage meat into a ball, then divide into four equal portions. Wrap one portion of sausage meat around each soft-boiled egg, covering each egg completely. Carefully lower the Scotch eggs into the hot oil and fry for 7-8 minutes, or until the coating is golden-brown and the meat is cooked through. Remove from the oil using a slotted spoon, then set aside to drain on kitchen paper. Keep warm. Carefully lower the sliced vegetables into the hot oil in batches and fry for 2-3 minutes, or until crisp and golden-brown. Remove from the oil using a slotted spoon, then set aside to drain on kitchen paper. Season, to taste, with salt and freshly ground black pepper. 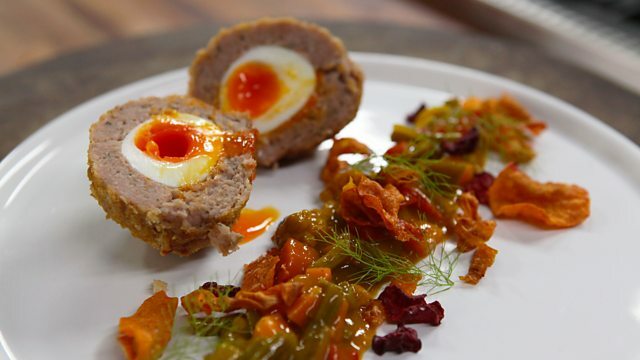 To serve, cut each Scotch egg in half and serve with a handful of vegetable crisps and a dollop of piccalilli.